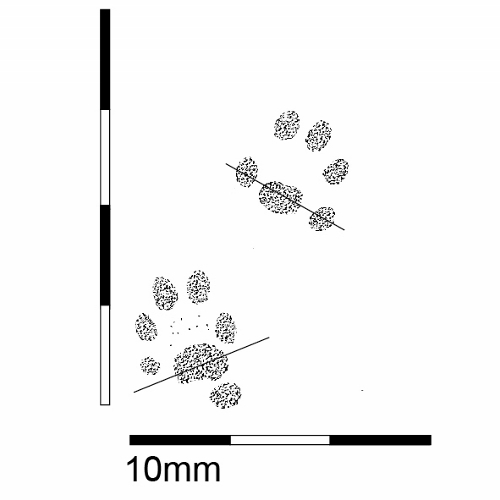 Weasels are the smallest of the three mustelids that occur in New Zealand, so their footprints are also the smallest. The size of the forefoot is about 13 mm long by 10 mm wide and the hind foot is 15 mm long and 13 mm wide. The forefoot has three toes pointing forward and two either side of the central pad. All five hindfoot toe pads are in front of the central pad midline. Toes 2 and 3 (with 1 being the ‘thumb’) on the feet are often close together.